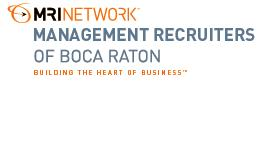 Management Recruiters of Boca Raton is dedicated to "Building the Heart of Business™", enabling people and companies to reach their full potential. As industry experts, we take pride in developing qualified and long-lasting relationships with all of our customers. In working with our recruiters, you will find integrity, passion and a commitment to excellence. We know and understand first hand, the importance, impact and cost of every hiring decision. At MRI of Boca Raton, our job is to make this process easier, faster and more cost-effective for our clients. Our success is based on surrounding ourselves with a strong team of professionals and leading them towards excellence. We believe good talent is not expensive, it is indispensable.